Avoiding Common Bike Accidents — Bruce S. Deming, Esq. While there is an infinite combination of contributing circumstances in crashes involving cyclists and drivers, I have seen a pattern in my many years of investigating these incidents and representing injured cyclists. As a bicyclist, if you are aware of the most common problem areas on the road, and ride responsibly and defensively, many of these crashes can be avoided. Be aware of these potentially dangerous situations, and keep in mind my tips for avoiding these scenarios while riding. The most common accident scenario in road cycling is the left hook. 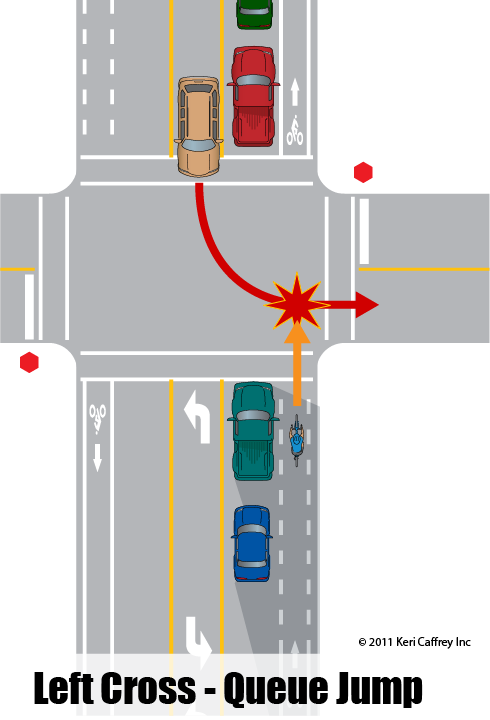 A left-turning vehicle fails to yield to the oncoming cyclist in the opposite lane, and either runs the cyclist down outright, or the cyclist collides with the turning vehicle’s front passenger side fender. Inevitably, the driver will admit that he just “never saw” the cyclist, or claim it was the cyclist’s fault because he/she “just came out of nowhere” and must have been riding too fast. Typically, of course, neither is true. The cyclist didn’t “come out of nowhere” - he or she was visible in the approach the entire time. And he probably wasn’t exceeding the speed limit, either. What causes these accidents is the simple fact that the human brain often fails to “see” smaller objects like bicycles because it is really on the lookout for cars, trucks, and buses. The way to avoid these accidents is simple: never assume that an oncoming left-turning vehicle can see you. And forget that stuff about “making eye contact” unless the motorist specifically waves you forward. They may have made eye contact with you and they may not. So ride accordingly. Have a bail out option. And if one isn’t available, slow up and let the turning vehicle complete its turn. It may slow down the flow of your ride, but it could save you from a nasty crash. The right hook is the second most common scenario, and it can be devastating. A motorist passes a cyclist on the left, and then makes a right hand turn directly into the path of the cyclist without signaling or otherwise checking his right hand mirror to make sure that the coast is clear. I never cease to be amazed at how drivers can “forget” about the presence of a slower moving cyclist that they just passed mere seconds before making that right hand turn directly into the cyclist’s path. In my view, it comes back to the brain’s non-recognition of the cyclist. The driver is capable of seeing the cyclist, but it just doesn’t register in his or her cognitive thought. The third most common wreck is when the cyclist simply rides out into a roadway from a cross street or driveway, and fails to yield to the cross traffic. In most cases, this is a “failure to yield” scenario on the part of the cyclist, not the car, and fault will almost always rest with the cyclist in terms of a claim for damages. It should go without saying that before entering any roadway, stop, look, and wait as long as necessary to make a safe entry into the flow. Your life depends on it.